A.J. Dillon scores on a 15-yard run in last Saturday’s win over Central Michigan. A year ago, AJ Dillon was leading Lawrence Academy’s football team, having rushed for 172 yards and three touchdowns in a 34-28 victory over St. Sebastian’s. That would be Dillon’s final game before arriving at Boston College this season, his prep school career ending with an injury. 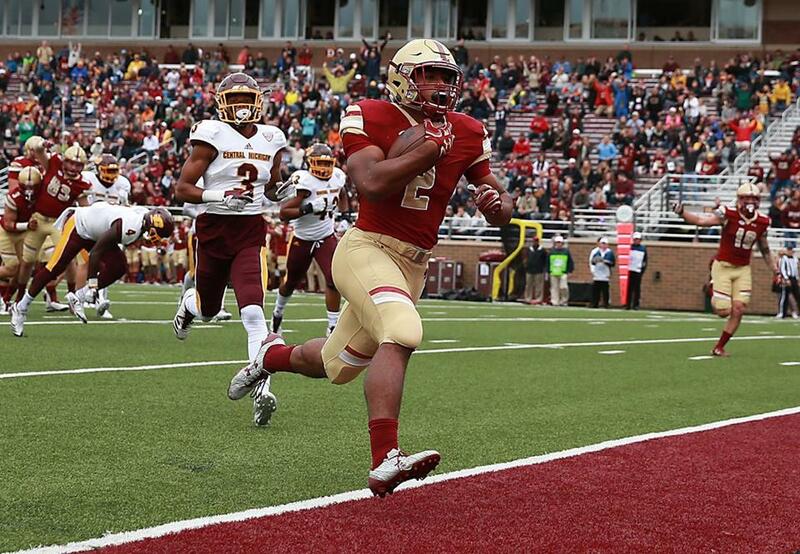 Dillon has adjusted quickly in his freshman season, playing a key role against Wake Forest, Notre Dame, and Clemson before a breakout 120-yard performance in BC’s 28-8 win over Central Michigan last Saturday. Dillon’s indoctrination continues when the Eagles (2-3 overall, 0-2 ACC) play host to Virginia Tech (4-1, 0-1) in a conference game at Alumni Stadium Saturday night. “He’s getting better every week,” BC coach Steve Addazio said. “Each week he’s taking more work, each week he’s handling it better. “As you would imagine, there’s a lot of little things along the way that have to be corrected, but that’s to be expected. Obviously, the best is yet to come, we all know that. But he’s making progress, doing more things and better and I’m excited to watch it. Dillon might have been flying under the recruiting radar, competing in an eight-game ISL season in Groton. And despite sustaining a broken right fibula last year, Dillon had plenty of choices when it came time to college. “When you have the University of Alabama, Michigan, and Florida State in your office — basically, anywhere he wanted to go he could,” Lawrence Academy coach Paul Zukauskas said. Zukauskas, who played and was an assistant at BC, plus had a four-year NFL career, coached Dillon for four years. “I always feel you can never predict the future, but I had a feeling he could be pretty good pretty quickly,” Zukauskas said. “It’s not surprising he’s playing and helping BC. It’s a big thrill for him and me and his family. “He had a lot of choices, and he thought a lot about it, where he wanted to be in the future. It’s tough to prepare for, sure. Some high schools play football all year round and have complicated playbooks, and we’re not one of them. Statistically, Dillon has arrived, totaling 298 rushing yards, second to Jon Hilliman (325) on the team. “Obviously, 100 yards is the staple for a running back,” Dillon said. “You know you had a good game if you get to that point. Our O-line is working really hard, the entire line opened lot of holes. There were a lot of opportunities for me and Jon and you’ve just got to capitalize on those, and also the receivers blocking up front. Dillon has scored two touchdowns, including the tying score in a 34-7 loss to Clemson. The Hokies, who held BC to six first downs in a 49-0 win last season, will present a difficult challenge. “I know they have some really good guys,” Dillon said. “Their linebacking corps, that’s primarily what you look at in protection. I’m going to keep studying that and try to figure out the best way to attack each scenario and blocking schemes. “Playing running back, there are a lot of different responsibilities you have. The pass game, you have to understand the defense, blocking assignments, and, obviously, the run game.